Life’s trials and tribulations are a preparatory course of sorts, a journey of peaks and valleys on a long and winding road, and through the flames of adversity rises a phoenix. 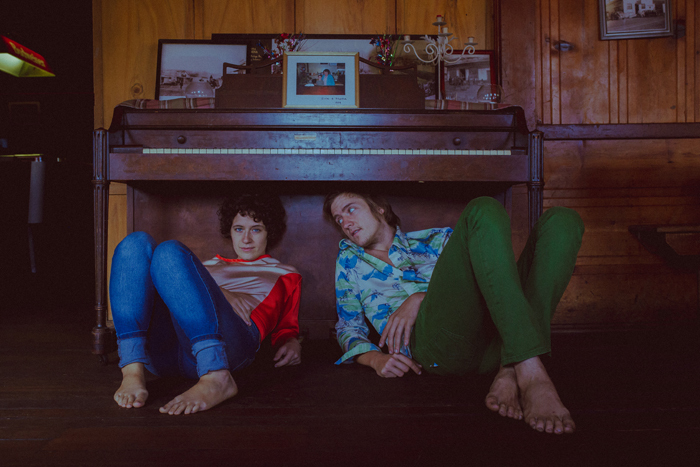 On May 21, 2016, Anna Moss and Joel Ludford, the duo of multi-instrumentalists that comprise HANDMADE MOMENTS, were riding along a different road of sorts. On that fateful afternoon in Northern California, their beloved bio-diesel bus- that they spent six months laboring to build, and lived, toured and gigged in for nearly a year- was struck by two vehicles in a harrowing head-on collision. The resulting wreck required a Medivac for Ludford, who was severely injured from the waist down. He spent a month in the hospital, three more in a wheelchair. Moss herself had a concussion, two other passengers were injured as well, and all four called themselves lucky to be alive. Up until that point, Handmade Moments was patiently making their way in the music world, products of a fertile art scene in Fayetteville, Arkansas, where they’d amassed a fervent and enthusiastic following. Born from the ashes of the rock band Don’t Stop Please, in 2014 the quirky, jazzy crew released a self titled debut Handmade Moments. A series of tours followed, and the prolific pair won hearts beyond the Ozarks, with that came 2015’s critically acclaimed Eye in the Sky. The hip-hop folk-roots group was gigging their way from Coast to Coast, and soon went international, venturing to South America, where they planted firm roots in Argentina. Their story seemed to be going along swimmingly, until one day, it wasn’t. Their home, vehicle, instruments, just about everything Moss and Ludford had worked so hard for- was destroyed, in merely an instant. But apparent from the moment Moss returned home from the hospital and began writing a song, the calamity had not extinguished their spirits. The ultimate reality check had arrived in death-defying fashion, and they’d live to sing the tale. Ludford and Moss retreated into the nurturing bosom of Nevada City, CA area to recover, and begin the healing process the only way they knew how, through music. Over the next three months, these meditations and ruminations fueled the writing, recording, and realization of Paw Paw Tree, their third full length LP and Jumpsuit Records debut. That reclamation comes on May 21, 2018, as Moss and Ludford return weathered, stronger, and wiser for the time; two years to the day from the accident, emerging a bolstered and emboldened Handmade Moments. The diverse collection of songs is riveting from start to finish, an amalgam of their rock and jazz past, juxtaposed with Southern roots and folk DNA, scrambled together and evolved into the current continuum that reveals Paw Paw Tree. Ornate instrumentation details the bedrock of their simple yet sophisticated songcraft, and endearing, intoxicating personality. Handmade Moments’ piercing lyricism and carousing croon both tell their own inspirational tale, and encompass larger themes that resonate within us all. This musical document unveils a myriad of tones, from walking upright bass to silky saxophone; it embodies an intelligent, progressive culture and celebrates a simple way of life. “Fighting a Mountain” imagines a friend stranded in raging waters, but you are unable to help, restrained by physical barriers. The title track envisions a post-apocalyptic world with desert farms, a pointed statement against input-reliant agriculture and rallying cry to restore the ecosystem. “Junkie” is not your typical lover’s lament, and uses muse and real life metaphor to emphasize emotions that know no bounds, until they are no more. Paw Paw Tree is filled with lyrical life lessons, statements on the state the union, and examinations of those fragile, human elements that define each and every one of us.